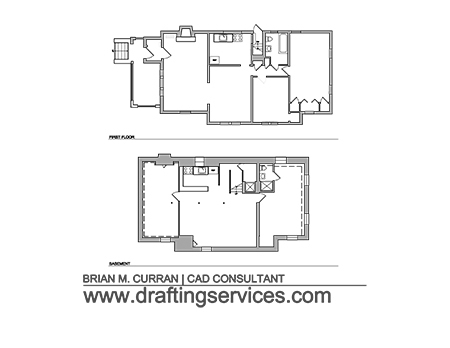 In my role as a drafting consultant I complete many different projects each year that simply consist of me drafting AutoCAD floor plans. I could be contracted to create such drawings for an Architecture firm, Engineering firm, Homeowner, Real Estate Agent, Building Owner, or …the list goes on. The plans I create are of existing structures, as opposed to design concepts for future construction. Examples of the types of structures that I could encounter are: an entire building, residential house, single apartment, restaurant, retail store, factory, warehouse, theater, or some other type of space. Two weeks ago I created plans of an existing residential house that is located in Queens, New York. I produced the plans for a New York City Real Estate Investor who I’ve drafted for in the past. The project went smoothly, and below is a summary of it, including a PDF of the plans. A New York City Real Estate Investor contacted me and requested that I create floor plan drawings of a residential house he had just purchased. The house was a one story dwelling with a full basement. The Investor wanted both the first floor and basement field measured, drafted, and then the drawings emailed to him in PDF format. I’ve done drafting work for this Investor before, so I scheduled a day to field measure the house, and requested that he have someone unlock the house in the morning before I was scheduled to arrive. He did just that, so when I arrived on site I had immediate access. Once I accessed the house, the only thing I needed to do was measure it. I indeed measured it, and the measuring went swimmingly. Below is a detailed summary of the project, in table format. Type and Location: A residential house located Laurelton, NY (Queens). Scope of Work: Create floor plan drawings. Floor Plan Area: 2,111 sq.ft. Was the space occupied? : No. Access Restrictions: No, the house was left unlocked for me. Field Setup and Breakdown Time: My setup and breakdown time is included in my field time. Typically setup and breakdown takes ten minutes each. Total Travel Time: 2.50 hours total for the round trip. Misc. Time: Approximately 0.50 hour of project coordination. Field Equipment Used: Hand held laser, tape measure, point-and-shoot camera, pens, pencils, eraser, paper and foam board. Comments: This was a standard residential floor plan project. A project sample of AutoCAD floor plans. That’s all for this AutoCAD floor plan project summary!